Reading the passage again, I am struck that the lectionary compliers did not have the courage to give us more of the text as believe that we can only really make sense of Jesus' words by setting them in the wider context of th rest of John 18. That said, even in the confines of these few verses, Jesus is mystifying, enigmatic, enlightening and confrontational all at once. 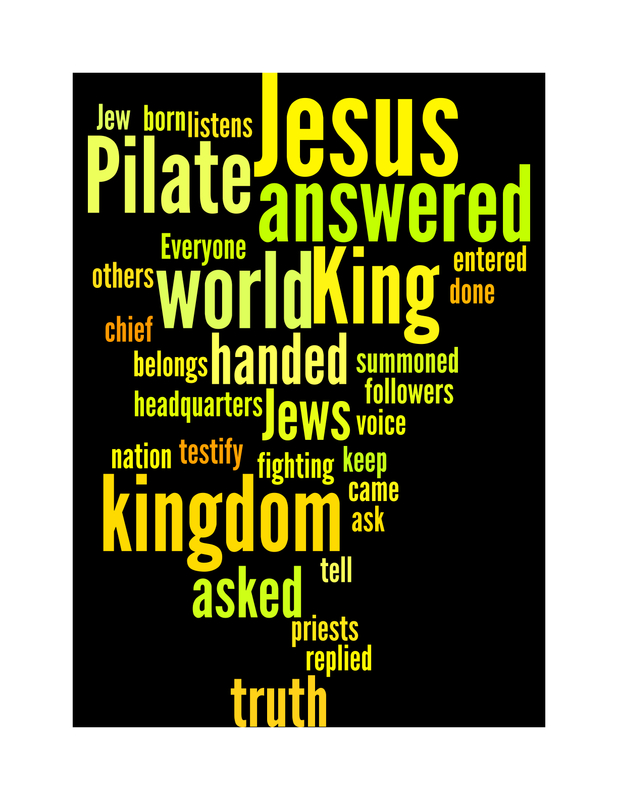 Pilate asks Jesus about his kingship. This is a question about geography, politics and military might. 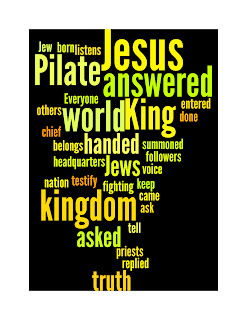 We will never really know what Pilate was gettig at or what his notion of kingship meant. Did he have Caesar or the puppet-king Herod in mind? Either way the Messianic connotations will not hav been common parlance for him, but he must have been aware of them. Either way, Pilate throughout John 18, is constatly looking to do the right thing. So we join him trying to make sense of why Jesus has been sent to him and to give Jesus a chance to defend himself. Jesus, as he usually is especially in John's Gospel, starts to be infuriatingly allusive. 'My kingdom is not of this world' says Jesus. What on earth? But then that's maybe the point. Jesus is perhaps trying to expalin some Messiah theology to a non-Jew. You have no need to be threatened, says Jesus, as my kingly power is not about politics or the exterior world of geography and place. The kingdom says Jesus, centres itself in the realm of truth and values. The kingdom of God is not therefore about the exterior world but about the inner landscapes of the human heart - the place where truth, love and values reign and rule our lives and lifestyles. Well folks that's the beginnings of where the sermon is going. I will try to post more as we near Sunday!